You’ve spent all day playing on Surfside Beach’s sandy shores or fishing for that Instagram-worthy trophy fish. Needless to say, you’re probably starving. Fortunately, you don’t have to go far for a fantastic meal. Surfside Beach has numerous restaurants that serve up a wide range of foods that will satisfy whatever you are craving. Some even have bars where you can end your day with an ice-cold beer or a glass of wine and some live music. What better way to end a day on the Texas Gulf Coast? Delicious food, great drinks, and breathtaking coastal views await at this restaurant located steps away from the Beachfront RV Resort. Bingo Boards combines a surf store with a café to serve up the ultimate one-stop-shop for all things beachy. Order up breakfast at any time of the day, or refuel with your choice from the burgers and sandwiches, salads, and seafood and poultry menus. Pay a visit to Dorado’s Dive Club for the burgers, fried fish, oysters, and bar that crafts cocktails and pours pints of beer. Hang out on the deck overlooking the intracoastal waterway and, if you time your visit right, enjoy the live music. A local favorite, Jetty Shack is one of the oldest restaurants in Surfside Beach well known for its friendly atmosphere, jumbo Angus burgers, and ice-cold beer. Given its name, it’s no surprise Kitty’s Purple Cow is easy to find. Its bright purple walls and whimsical interior sets the place apart, while its menu of classic coastal seafood, burgers, beer, and wine gives you plenty to choose from. Breakfast is served on Saturday and Sunday mornings. 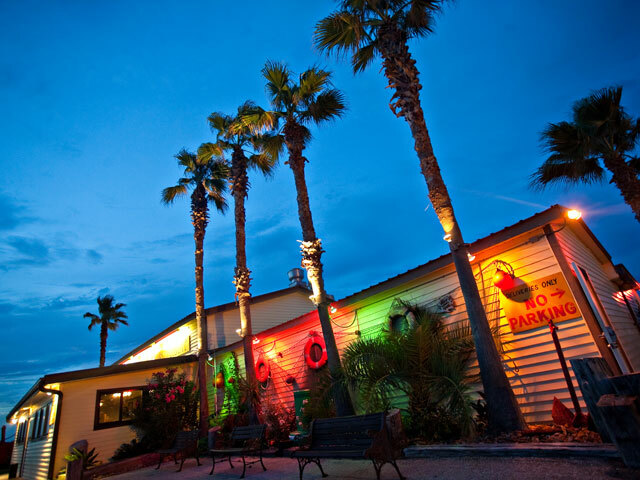 Fresh gulf seafood with a taste of the Mediterranean; what’s not to like about the Red Snapper Inn? Serving American, Italian, and Greek style dishes such as crab Florentine, grilled flounder, and charbroiled steaks, there’s something delicious here for everyone. More than 200 feet of beachfront dining area offering fresh Gulf seafood, burgers, salads, and sandwiches. Serving breakfast, lunch and dinner, take out and catering. Belt out a tune on karaoke night, kick back and enjoy live music performed by talented local performers, and savor hearty burgers and something from the bar.